Enhanced Geothermal Systems (EGS) are human engineered hydrothermal reservoirs developed for commercial use as an alternative to naturally occurring hydrothermal reservoirs, which are not known to be abundant. 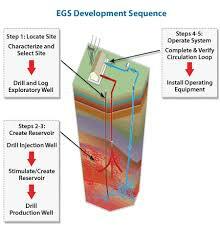 EGS reservoirs are made by drilling wells into hot rock and fracturing the rock sufficiently to enable water to flow between the wells. The very hot water exits the reservoir via production wells. When the water reaches the surface, it passes through a power plant where electricity is generated. Water is returned to the reservoir through injection wells when it leaves the plant, thus completing a loop. Plants using a closed-loop system to generate electricity do not release any fluids to the atmosphere and will not have any greenhouse gas emissions. Each step requires implementation of technologies specialized for the uniquely challenging geothermal environment. ↑ 1.0 1.1 (Published: July 2009) "US DOE 2008 Renewable Energy Data Book"
↑ 2.0 2.1 "The Future of Geothermal Energy"
↑ 3.0 3.1 3.2 3.3 "US DOE EERE Geothermal Technologies Program, Enhanced Geothermal Systems Technologies"
This page was last modified on 12 April 2017, at 08:43.